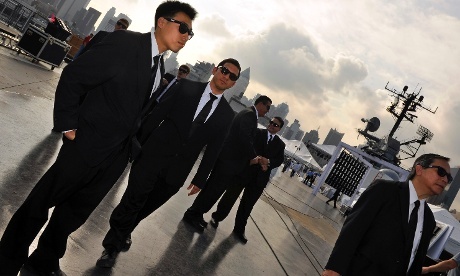 So There Really Are Men in Black, Right? Right???? | The Cineaste's Lament. ← Another “Snow White and the Huntsman” Featurette: This time it’s Kristen Stewart’s turn. So There Really Are Men in Black, Right? Right???? With the release of “Men in Black 3,” The Guardian takes a look at the folklore surrounding UFO sightings, specifically, the tales of black-clad men who were rumored to show up in the wake of such sightings to talk to witnesses and, one assumes, to cover up all those awesome secrets. Sadly, there really aren’t that many good UFO sightings any more. I remember watching the old “In Search Of” show on a UHF station out of Springfield, Mass. in the 1970s. The details have long escaped me, but I vividly recall host Leonard Nimoy talking about the Air Force’s “Project Blue Book“ and the Roswell incident. In 1953, Albert K Bender, the editor of a UFO publication called Space Review, announced that he’d found the solution to the flying saucer mystery but had been forbidden to print it. He warned others working in the field to be cautious, and then stopped publishing. Later he said that three men wearing dark suits had told him to write no more about UFOs, and he’d obeyed them because he’d been “scared to death”. Thereafter, other people who’d been present at putative UFO encounters also reported approaches from black-suited figures who tried to enforce their silence. These characters resorted to psychological pressure when necessary and, if that failed, to physical harm. Some of the people who were approached assumed that their callers were representatives of a secret government agency, like the one featured in Men in Black 3. Sometimes, however, there were indications that the troubling visitants might themselves be aliens. Something about them was often not quite right. They walked with an odd limp, spoke in monotone or were deathly pallid. Their brand-new limousine was actually a long discontinued model. They failed to recognise common objects like ball-point pens. Their dark glasses appeared to hide unnaturally glowing eyes. Of course, we should treat with caution the accounts of people who claimed to have recently seen a flying saucer. They’re bound to have been in a somewhat excitable state. This entry was posted in action, Film News, Sci-Fi, Thinking About Movies and tagged In Search Of, Leonard Nimoy, Men in Black 3, Project Blue Book, Roswell, science fiction, UFO sightings, Urban Myths. Bookmark the permalink.